In a modern society it is hard to imagine that our ancestors ever supported or tolerated slavery. Most people today find the idea of one person being legally able to own another as repugnant. Although slavery still exists today, it is nowhere near as acceptable as it was in times past. For the rich capitalists who saw limitless wealth in being able to exploit a whole race for profit. It became a priority to be able to justify the practice to the public. This was achieved through racism. They pushed the mantra that the black person was somehow inferior to the white person and was therefore not worthy of the same rights and natural justice that a white person could expect. Slavery has existed in many forms in most parts of the world for many thousands of years. Free labour was a good way to get rich quickly. The United States was split in two and a vicious war fought from 1861 to 1865 over the rights of the wealthy southern cotton farmers to maintain ownership of slaves. After 600,000 deaths and the complete destruction of the southern economy, the slaves were freed. Meanwhile, disgruntled ex-confederate officers went on to form the Ku Klux Klan, whose basic tenet was white supremacy. But that never happened in Australia, right? We wouldn't exploit people like that. We believe in a fair go for everyone, don't we? I don't remember reading anything in the history books at school about slavery or race exploitation in Australia. But the fact remains that between 1860 and 1970, aboriginal people were forcibly removed from their homes with many sent to work for wealthy graziers and cattle stations. They were forced to work up to 16 hours per day for little or no compensation. Some of them worked the same station for 30 or 40 years; slaving for decades until they died. The irony of it all was that the state and federal governments used the excuse that this was being done to prevent aborigines from being mistreated. The term 'hypocrisy' would be a better description. The laws during this time gave the government an extraordinary amount of control over the lives of aborigines, including determining where they could live, where they worked and whether they were paid for their labours. Every state had its own laws. For example, in Western Australia, aboriginal children from the age of 12 could be institutionalised and sent to work wherever the government desired. Boys were generally sent to work no pastural properties, while girls worked as domestic servants. They were given no protection and were often exposed to both physical and sexual abuse. Historian Rosalind Kidd states that 'floggings were common, police would find runaways and send them to Palm Island as punishment'(1). Palm Island was so far from most of their families that this policy ensured the family unit was torn apart. So the question has to be asked. How slavery could be tolerated in Australia? The answer is simple. From the time of invasion, the aboriginal people were portrayed as a lesser species and inferior to the white race. They were dehumanised and regarded as sub-human. This has always been the justification for slavery by greedy capitalists. Once they succeed in dehumanising a culture, the general population turns a blind eye to human rights abuses. It has been a tactic of the wealthy classes for thousands of years. Many of those on the political right-wing continue to deny the evils of slavery, racism and capitalism while many of those who oppose slavery and racism are too apathetic or lazy to do anything about it. Anyone exploited by the white capitalist system should have a right to compensation. Without it we cannot consider ourselves a fair minded people. 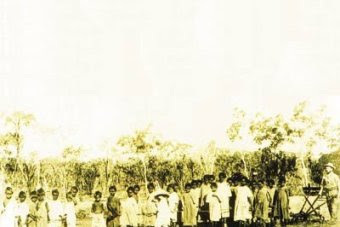 Aboriginal children removed from homes and sent to work on missions(1). But this is all in the past, isn't it? Not at all! The Red Cross managed Support for Trafficked People Program received 235 referrals of slavery victims between 2004 and 2014(2). We see the racist policies of our government used to treat refugees as a sub-human species and all Muslims demonised as terrorists. It's a sad fact that a lot of the perverted racist dialogue is coming from the pulpits of many right-wing Christian churches. If Jesus were alive today he would no doubt be ashamed and appalled. and claim he’s on their side! And he’d rot in their stinking jails. 2. 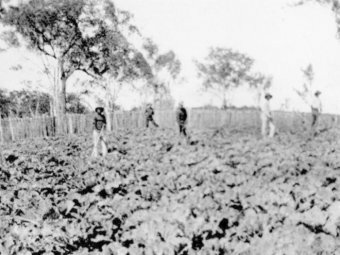 Alecia Simmonds, Daily Life, 'Australia needs to own up to its slave history', 28 April 2015, http://www.dailylife.com.au/news-and-views/dl-opinion/australia-needs-to-own-up-to-its-slave-history-20150427-1muhg3.html. Accessed 7 January 2016.